Clashes have broken out in Baltimore’s Camden Yards as demonstrators began throwing bottles at police and smashing cars. Thousands of marchers took to the streets to protest the death of Freddie Gray, a black man who died after being detained by police. Police in riot gear charged some of the protesters after they smashed police cars and threw objects at the officers. RT’s video agency Ruptly’s Paulina Leonovich says the cops have made several arrests at the scene. #Ferguson foreshadowing @rousseau_ist: Police Lining up 4what looks like prep to charge the protest #FreddieGraypic.twitter.com/OG1N4Grn5E"
Demonstrators had smashed a garbage can through the rear window of a police vehicle, while other protesters started jumping on top of cars in the vicinity. The constitution guarantees citizens the rights to protest. Please remain peaceful. Several of our police cars have been damaged. 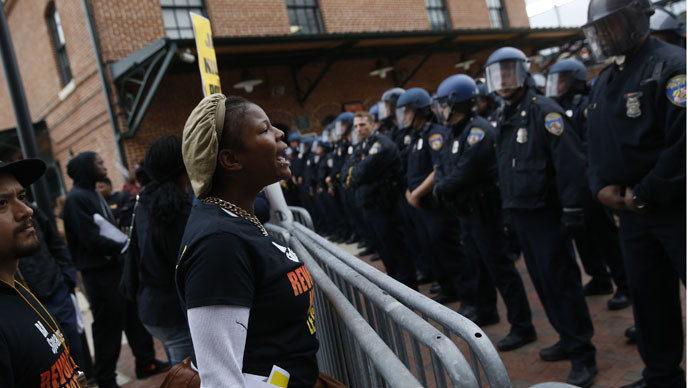 Baltimore police confirmed on their Twitter feed that a total of 12 people had been arrested during the unrest. As the protests were winding down in Baltimore, there was the surreal scene of more than 300 law enforcement officers keeping just 20 demonstrators in check. The cops in riot gear were marching down the street in unison, beating their truncheons against their shields and shouting, “move over” at the bewildered public, who were more interested in taking photographs than causing any trouble. The rally started with over 1,500 protesters gathering at the spot where Freddie Gray was arrested on April 12. When the protesters eventually got to City Hall, which was following the planned route of the march, they took down the American flag and replaced it with a black and white flag instead. The Baltimore PD were out in force and had been keeping a watchful eye over the protesters. Some of the demonstrators had urged law enforcement officers to “stand down,” while they were also holding placards and shouting, “hands up, don’t shoot” at the cops. Chants of “Freddie, Freddie” could also be heard from the sizable number of demonstrators. Malik Shabazz, an attorney and President of Black Lawyers for Justice was one of the leaders of the march. He shouted, “We’ve got to shut this city down!” and “We don’t fear no police today!” into a microphone. Law enforcement officer’s initially kept a low profile, as helicopters flew overhead. The police were trying to prevent any repeat of the violent confrontations that marked the Ferguson protests in 2014. Details are still sketchy regarding how Gray suffered a severed spine while he was being kept in police custody. It is also unclear what happened once the suspect, who the police say was carrying an illegal switchblade, was in the van, where he demanded help on several occasions. The six policemen, who had come in contact with the 25-year-old Gray that day, have been suspended while the investigation is being carried out.